2019 is going to be the year of Samsung. Samsung's Galaxy S phones always give us something exciting to look forward to at the beginning of each year, and 2019 officially marks the 10-year anniversary of when the first Galaxy S flagship was released. Similar to what Apple did with the iPhone X, we're expecting the Galaxy S10 to be truly special. The Galaxy S9 and S8 were both excellent phones, but in honor of such a big anniversary, Samsung will likely pull out all the stops to release a truly special and jaw-dropping gadget. If you're ready to learn more about the Galaxy S10 and find out what we could look forward to this February, here's everything you need to know. Unless you've been living under a rock for the last few months, chances are you have a pretty good idea of what to expect from Samsung's Galaxy S10 phones. They've been leaking nonstop since June of last year, and seeming to have caught onto the fact that people have been following these leaks, Samsung's now allowing you to reserve the S10 on its official website — before the phone's actually been announced. On the reservation page, Samsung says, "We know you know what is coming soon." You can fill out a form with your name, eamil, zip code, and preference of which carrier you want to get the phone on. Once you do that, you'll receive an instant $50 credit that can be used towards accessories and get a guaranteed delivery by March 8 for your shiny S10. If you want to bump up your savings even more, you can also trade-in your current phone and get up to $550 back depending on the make and model of it. You can reserve your S10 up until February 20, and once you do, you'll have 72 hours to make your purchase. Over the weekend, tipster Evan Blass shared high-quality, watermark-free renders for the Galaxy S10e and Galaxy S10. To kick off our Monday right, the Galaxy S10+ is now getting similar treatment. We've known what the Galaxy S10+ will look like for quite a while now, but it's still nice to see renders in a high resolution with no pesky watermarks to block anything up. As expected, the phone will have three rear cameras, a cutout in its display for two front-facing cameras, and a glass back that'll be available in a multitude of colors. I've heard of mystery shopping before, but this is just kind of ridiculous. We're still over a week out from the Samsung Galaxy Unpacked event on February 20, but that apparently hasn't stopped the Samsung Philippines web store from opening up pre-orders. The pre-order process screencapped and tweeted this afternoon gives users four phone Options — unhelpfully titled Option A, B, C, and D — which users could use to pre-order the Galaxy S10 sight unseen through a Early Pre-order page. Option A is listed as a Limited Edition with a release date of March 15th, for whatever that's worth. Included with pre-orders was a Mystery Box whose contents are allegedly worth almost $600, but the terms listed on the pre-order site — and in the confirmation page — seem odd, as the end of the Early Pre-order period is stated as February 17, three days before the Samsung Unpacked Event. The pre-order also doesn't state final prices, only the down-payment for your pre-order — which has to be made in-person at a Samsung Philippines store. But the website is up and all that seems to be needed to get in a pre-order is an email address and the ability to go pay for it in the Philippines, so if you meet that description and you're feeling lucky — or are a diehard Samsung fan that will love whatever phone Option A/B/C/D ends up being — knock yourself out. Another day, another S10 render leak, but at least today's flavor isn't watermarked and doesn't look like it lost a fight with a highlighter. Seriously, of all the bold shades Samsung could pick for a phone, yellow? Why not a candy-apple red or a forest green? You remember that Emerald Green Galaxy S6 Edge? Why can't we get more of that?! Anyways, the chins on these renders look a little more pronounced than some previous leaks, especially on the S10E, but everything else gels with the rest of this render flood we're wading through on our way to the Samsung Galaxy Unpacked event in San Francisco this month. We're in the home stretch now, folks, and February 20 can't get here fast enough, but at least we have renders like these to help us decide which model we want to pre-order. The Galaxy S10e, Samsung's "affordable" S10 variant, has already leaked numerous times. However, a new render that's appeared now showcases the device in a striking Canary Yellow color. This Canary Yellow version of the S10e looks to be one of the boldest colors Samsung's ever created, featuring a yellow/gold-tinted frame and a deep yellow hue on the back. I'm guessing this is a design people will either love or hate, and while yellow may not be my personal favorite color, I always love seeing OEMs dabble with different aesthetics like this. In addition to the Galaxy S10 series, there have been murmurings that Samsung will also use its big Unpacked event to unveil new wireless earbuds called the "Galaxy Buds." The above render not only gives us our first look at the Galaxy Buds, but also clues us into a possible tie-in it'll have with the Galaxy S10+. It's unclear if this reverse wireless charging will be as extensive as the Mate 20 Pro's and deliver wireless charging to virtually any device or be limited to just the Galaxy Buds. Either way, it's a fun party trick and one that we can't wait to see if this turns out to be legit. If you saw that Galaxy S10e leak from a few days ago and thought to yourself, "That's cool, but I want to see more", today's your lucky day. In this latest leak, we get a glimpse of the S10e in hands-on photos as opposed to device renders. The phone itself looks exactly like what we saw on February 1. The display isn't curved and there's a camera cutout in the right corner for the front-facing camera. The S10e name is further reinforced with the power-on logo screen in one of the photos, and we also get an idea of how Samsung's One UI will look on the phone. Yesterday, we got a look at official press renders of the Galaxy S10+. Now, we've got leaked renders of the Galaxy S10e (what we've previously been calling the Galaxy S10 Lite). As seen in the renders, the S10e has a flat display with no curved edges unlike all past versions of the S9 and S8. There's also a hole-punch cutout in the top right corner for the front-facing camera, and according to WinFuture, we can expect the display to measure in at 5.8-inches. On the back of the S10e is a glass back, and as the renders reveal, it'll be available in Pear White, Prisim Black, and Prism Green colorways. We've also got dual rear cameras, physical Bixby button, a power button that'll double as a fingerprint sensor, and a 3,100 mAh battery. According to this report, the Galaxy S10e with 6GB of RAM and 128GB storage is reported to cost €750. That's lower than the €779 price we previously heard, but it's still not cheap by any means. We've seen concept designs, artist renders, and leaked hands-on photos of the Galaxy S10 series. Now, we have what's reportedly an official press render for the Galaxy S10+. Like we've seen in other leaks, this render confirms a hole-punch cutout in the display for two front-facing cameras, three rear cameras, and a glass construction on the back. Past renders have suggested that we'd get four rear cameras, but if this is legit, Samsung will be sticking with just three. The display's likely a Super AMOLED panel, and as you can see, is surrouded by very tiny bezels. After yesterday's bizarre Samsung Blockchain Keystore leak, we now have a new batch of hands-on photos courtesy of AllAboutSamsung. This leak showcases the Galaxy S10 and S10+, and while the devices shown here are technically prototypes, they look a lot like the final products we're expecting to see on February 20. As we've seen from other leaks, both phones have large AMOLED displays with very small bezels all around. The S10 has a cutout in the top right corner to accommodate its single front-facing camera, whereas the S10+ has a larger cutout for two sensors. At this point in time, we've seen just about everything there is to see when it comes to Galaxy S10 leaks. Ben Geskin on Twitter recently shared a trio of new hands-on photos of the device, giving us yet another look at the phone's gorgeous AMOLED display with that iconic hole-punch cutout in the top-left. However, what's really caught our eye is what's shown on the screen. Will a lot of people use Samsung Blockchain Keystore? Probably not. However, if Samsung does want to get in the crypto game, this seems like a much better idea than creating a phone that's based entirely around this stuff. There's been a lot of speculation surrounding what Samsung's Galaxy S10 series will cost, and now thanks to a report from SamMobile, we have new numbers to possibly look forward to. Lastly, for the special Galaxy S10 X with 5G, it's said that it could cost as much as €1599 — around $1,800 USD. Another day, another S10 leak! This one comes from Evan Blass's @evleaks twitter account, showing a full lineup render for what appears to be the S10 version of the Speck Presidio Stay Clear Case. The beauty — and curse — of clear cases is that you can see where all of the ports and buttons are instantly, and eagle-eyed enthusiasts might spot a few ports of interest here. The cutouts on bottom show a speaker, USB-C port, and headphone jack on all three models, and we've lightened the original image to improve the clarity of the camera configurations on the three models show. The Galaxy S10 leaks are now coming in thick and fast. The latest leak via Reddit shows off what looks like a Galaxy S10+ in a security case. The graininess of the image prevents us from making too many observations, but what's clear is that the device will sport a hole-punch cutout on the right side of the display that houses the camera array. According to a commenter, the phone in question is clad in Samsung's flip cover security case on to prevent identification, suggesting it could be a prototype unit. We're expecting a lot of new tech with Samsung's Galaxy S10 phones, one of the biggest being a new type of in-display fingerprint sensor from Qualcomm that uses ultrasonic technology. The new sensor should be faster and more secure than other in-display sensors we've seen on other phones, but according to case manufacturer Armadillotek, it comes with a pretty big caveat. Armadillotek says that it's used real Galaxy S10 devices and that, unfortunately, the new ultrasonic in-display fingerprint sensor is not compatible with screen protectors. Screen protectors with other in-display sensors have worked just fine, but of course, they're not as fast or secure as we're expecting the S10's sensor to be. Even so, if you can't use a screen protector on the Galaxy S10, will that be a deal breaker for you? The Galaxy S10 secret weapon is a 'life pattern' mode. The technology to automate the smartphone function based on the artificial intelligence (AI) based on consumer smartphone usage pattern is applied for the first time. The 5G version of the Galaxy S10 X is said to be launching on March 29 with the LTE variant coming out in "early March." As for the Galaxy S10 Lite, S10, and S10+, it's noted that these will be available for purchase starting March 8. On February 20, 2019, in San Franciso, Samsung will hold its next Unpacked event where it'll finally unveil the long-awaited S10 series. That's just a few days before Mobile World Congress 2019 kicks off, indicating Samsung's pretty confident in the lineup and deeming it worthy of its own event. January 7, 2019 — Sprint's 5G version of the Galaxy S10 to launch "in summer 2019"
5G is expected to be all the rage in 2019, and on that note, the Samsung Galaxy S10 is what we're anticipating to be one of the first phones to support the new, faster network. Today, Sprint announced that it plans on launching a 5G smartphone this coming summer. While Sprint never mentions what Samsung phone it's referring to, it seems quite likely that the Galaxy S10 is the device in question. AT&T, Verizon, and T-Mobile have all already confirmed similar announcements, but this is the first time we've gotten anything more specific than just "2019." That "summer" timeframe is later out in the year than when we usually see Samsung's Galaxy S-line released, suggesting that the 5G model could be launched later than its 4G LTE siblings. We're creeping closer and closer to the spring launch of the Samsung Galaxy S10, and while we've seen several leaks surrounding the screen sizes, the camera cutouts and the like, a new leak from Ice Universe features one of the most important specs in a smartphone: the size of the battery! That battery on the S10 Lite is barely larger than the S9's 3,000 mAh battery, but the 4,000 mAh battery on the S10+ is a significant bump from the S9+'s 3,500 mAh capacity, bringing it up to match the Samsung Galaxy Note 9's 4,000 mAh battery. If you think that's going to translate to booming battery life, remember that the S10+ is projected to have a 6.4-inch screen — a bit taller than the Note 9. We'll have to wait and see what hardware these batteries are powering, and what new optimizations Samsung is bringing to the table with their first phones launched on the newly overhauled Samsung One UI. Following plenty of back-to-back renders and mockups of what the Galaxy S10 is expected to look like, we finally have our first hands-on picture of the phone that shows what it'll look like in person. The image comes courtesy of Evan Blass and the phone shown in the picture is said to be the "Beyond 1" variant of the S10. Based on what we know so far, that means we're looking at the Galaxy S10 Lite. Compared to past renders we've seen, everything lines up nicely with slim bezels all around and a small hole-punch notch at the top right for the front-facing camera. No other new details are revealed here, but it's still exciting to finally get a hands-on look at the device. The Night Sight feature that Google released on the Google Pixel 3 is an impressive feat of smartphone camera processing. It's little wonder that other manufacturers have already started rolling out similar features — like Nightscape on the OnePlus 6T — and honestly, I'm not shocked that new references in the Samsung Camera app reveal Samsung is hard at work on its own version of the feature. Honestly, I'd be shocked if it wasn't working on one. The name "Bright Night", however, is a surprise, and if I could just send a last-minute wish to Santa, I'd ask if he could name it something else. These strings were found by XDA in the Samsung Camera app on the latest Note 9 One UI Beta update, which makes me wonder if the feature will be held until the release of the Galaxy S10 or if it will be released before then. After all, the next Samsung flagship isn't expected to be announced until February at the earliest, and that's a long time to make users wait for a camera feature that other users have been enjoying for two months already. Whatever the case may be, these strings aren't attached to a live feature yet, so we'll have to wait and see when — and where — Bright Night arrives on Samsung phones. And if it arrives with that name, because hey, things can change in two months and Bright Night and Night Sight is a little on the nose, guys. The race to 5G is one of the fiercest competitions in the mobile industry right now, and in a blog post bad talking AT&T and Verizon's 5G efforts, T-Mobile quietly confirmed that it'll be getting a 5G version of the Galaxy S10 in 2019. Add to that all the hyperventilating both Verizon and AT&T did a couple weeks ago trying to lay claim to the first 5G phone – a phone ALL of us are working with this OEM to develop, and ALL of us are going to carry. That's right, T-Mobile is working on that phone too – and other 5G devices with other OEMs and chipset manufacturers. "That phone" mentioned in the post is a Samsung one that was shown off at Qualcomm's Snapdragon Summit earlier in the month and is widely expected to be a version of the upcoming S10. This news shouldn't come as much of a surprise, but it is nice to get confirmation from TMO that this is happening. The Galaxy S10 is set to debut at the end of February, but that isn't preventing accessory manufacturers from listing cases for the upcoming flagship. Olixar's range of cases for the Galaxy S10 are now up for pre-order at Mobile Fun, and they give us another look at the purported design of Samsung's 2019 flagship. Based on the case renders, it looks like the Galaxy S10 will sport three cameras at the back, and the lack of a cutout for the fingerprint sensor suggests Samsung is going with an in-display solution. The bezels up front are also razor-thin, and hint at a punch-hole design for the front camera. If you've already made up your mind about the Galaxy S10, hit up the link below to get your hands on cases for the device. While the cases are very affordable at $10, know that you may have to shell out at least $1,000 for the phone. Ready for a big pile of Galaxy S10 details? I sure hope so, because thanks to a "major tech retailer" that spoke with Gizmodo UK, we've got quite a bit of new information to dive into. The most interesting details to come out of Gizmodo's report has to do with pricing and availability for the S10 series. It's said that Samsung will hold an event on February 20 to unveil the phones, just five days before MWC 2019 will kick off in Barcelona. Pre-orders will apparently open that same day with the phones officially launching on March 8. 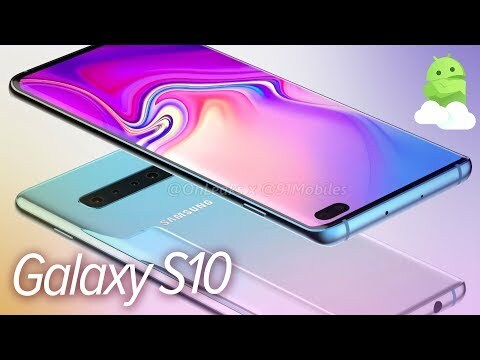 In regards to price, the 5.8-inch Galaxy S10 Lite will cost £669 in the UK ($850 in the U.S.) with the 6.1-inch Galaxy S10 costing at least £799/$1000 while the S10+ will go for £899/$1130. For the larger S10+, it's further noted that you'll be able to get as much as 1TB of internal storage for a grand-total of £1399/$1760. The report further reiterates the presence of an ultrasonic fingerprint sensor, Infinity-O style displays, and that a 5G version of the S10 will be available in "late Q2 at the earliest." This latest render comes courtesy of Samsung tipster Ice Universe and reveals a phone that looks very similar to the regular S10. There's a camera hole-punch cutout at the far right corner, and while the bezels surrounding the display are very thin, they do appear to be slighter thicker than the S10 and S10+. There's still no word as to how competitive Samsung's going to get with the S10 Lite's pricing, but if we can get a phone of this caliber around the $500 range, we could be in for something mighty special. We're still a few months away from an S10 reveal at Mobile World Congress, but rumors and leaks are now turning into concept renders. And while these from Ben Geskin are certainly problematic and theoretical, they're an interesting look at what the front and back of the new phones could look like. Indeed, it's interesting that in avoiding the notch and introducing a "hole punch" in the screen to accommodate the front-facing cameras, Samsung's so-called "Infinity-O" displays could be among the more controversial designs of 2019. While there's nothing definitive in these renders to say that they'll turn out to be what the S10 series looks like, it's clear that Samsung's status quo is disappearing and that it, too, will move towards a more modern, full-screen design in 2019. If you've been following the Galaxy S10 rumor mill, you'll know that we've been anticipating three different models — including the Beyond 1, Beyond 2, and Beyond 3. Now, according to a report from The Wall Street Journal, Samsung's working on a fourth variant that's codenamed as "Beyond X." While Beyond 1, 2 and 3 are expected to be released in February, Beyond X won't come out until later in the spring. It'll be marketed as a special 10-year anniversary celebration of Samsung's Galaxy S series, with two of the highlights being 5G connectivity and a total of six cameras (four on the back and two on the front). This combo will reportedly allow for "richer photos and better spatial perception." The screen will also be quite massive at 6.7-inches. During Samsung's developer conference on November 7, one announcement that the company seemed to rush through was a new lineup of Infinity Displays that are coming to future smartphones. In addition to the Infinity Flex panel, we were also introduced to Infinity-U, Infinity-V, and Infinity-O. According to a couple new leaks, the Galaxy S10 will ship with the Infinity-O style screen. It's unclear if the device in the photo is the S10 or a prototype showing off the Infinity-O display, but either way, it gives us an idea of how the front of the S10 will look. What do you think about the S10's take on the notch? It's been a hot minute since we had an update on the Galaxy S10, but that's changing today thanks to a series of tweets from trustworthy Samsung tipster Ice Universe. Furthermore, it's noted that the ultrasonic tech (that's being sourced from Qualcomm) will be exclusive to Samsung phones for at least half a year. This year's Galaxy S lineup is expected to be one of the biggest ever with three different S10 models being released at the same time, but according to a new report from The Bell, that could be changing next year. For the past couple of years, Samsung's released one regular Galaxy S phone and then a larger Plus model alongside it. That'll continue with the S10 series, but after that, it's said that Samsung will simply get rid of the Plus variant as it already overlaps the Galaxy Note line so much. This move is reportedly being made to "defeat profitability deterioration caused by the saturation of the smartphone market." We've already been expecting Samsung to introduce an in-display fingerprint sensor with the S10 series for some time, but thanks to a new report from Ming Chi Kuo at TF Securities, we now have specifics as to what kind of tech will be used for this system. Furthermore, Kuo goes on to say that this technology will also be present in "the most high-end model of the A series" as well as the Galaxy Note 10. For Beyond 0, the cheapest of the three models, there will be "side fingerprints. "Although we don't know for sure, this will likely be similar to the fingerprint sensor found on the Moto Z3 Play. As for the Beyond 1 and Beyond 2, it's noted that we'll see in-display fingerprint sensors. Here's something we weren't expecting. According to reliable tipster Ice Universe on Twitter, Samsung will announce the Galaxy S10 during Mobile World Congress 2019 in February. While that isn't out of the ordinary for Galaxy S phones, what Samsung might do just a month earlier is. In January at CES, we'll officially be introduced to the long-awaited Galaxy X. This is the foldable phone we've been hearing about for years, and should this turn out to be true, this would probably allow Samsung to easily dominate the first half of next year. Samsung's long been one of the top players when it comes to smartphone cameras, and on June 27, the company announced its latest innovation in mobile photography — ISOCELL Plus. ISOCELL Plus can capture considerably more light than Samsung's traditional ISOCELL sensors (first introduced in 2013), with Samsung touting as much as 15% greater light sensitivity. Perhaps even more impressive, Samsung notes that ISOCELL Plus "also enables image sensors to equip 0.8-micrometer (µm) and smaller-sized pixels without any loss in performance, making it an optimal solution for developing super-resolution cameras with over 20 megapixels. It's not explicitly said that ISOCELL Plus will be present on the Galaxy S10, but I'd be surprised if Samsung didn't include it on next year's phone. Jumping right into things, a report from The Electronic Times claims that Samsung will launch not one, not two, but three different models of the S10. The most affordable of the bunch, codenamed Beyond 0, will reportedly ship with a 5.8-inch display that's completely flat. Beyond 1, the mid-tier option, will also use a 5.8-inch screen but feature curves similar to what's found on the S9. The star of the show, Beyond 3, will boast a large 6.2-inch curved display and feature three cameras on the back — something we've never seen from Samsung before. As if three different models and a triple camera system wasn't enough to get you excited, The Bell also reported today that the Galaxy S10 will ditch the iris scanner of the S9 and replace it with a 3D facial-recognition system and in-display fingerprint sensor similar to what we've seen from the Vivo X21 and NEX. How many versions is Samsung going to launch? With the Galaxy S10 in 2019, Samsung is expected to shake-up its formula by releasing as many as four different models — codenamed Beyond 1, Beyond 2, Beyond 3, and Beyond X. Beyond 1 and Beyond 2 will be similar to older S flagships with the former having a flat screen while the other has Samsung's iconic curved display. Beyond 3 kicks things up a notch, expected to offer a larger screen and triple camera system on the back. For all intents and purposes, we're expecting these to be the Galaxy S10 Lite, Galaxy S10, and Galaxy S10+. Beyond X is the special 10-year-anniversary phone that's also coming, and as of January 14, it's reported that it'll be referred to as the Galaxy S10 X. The S10 X is expected to feature upgraded specs across the board, in addition to a "Life Pattern" mode that'll use artificial intelligence to automate certain functions based on your usage. This is also the only handset in the entire Galaxy S10 lineup that'll support 5G connectivity. What will the Galaxy S10 series look like? While we obviously can't say for certain what the Galaxy S10 devices will look like before Samsung officially unveils them, leaks, rumors, and renders have given us a pretty good idea of what to expect. The above renders come from Ben Geskin and showcase what the Galaxy S10, S10, and S10+ should look like. While you won't find a traditional notch at the top of any of the phones, there is a hole-punch cutout in the top right corner to accomdate the front-facing camera. There's just one of these on the S10 Lite and S10, but on the S10+, we can see two lenses. Also expected is a glass back, USB-C for charging, and a 3.5mm headphone jack. What kind of specs are we anticipating? A lot of the specs for the Galaxy S10 series are still up in the air, but even so, there are a few things that we feel fairly confident we can look forward to. The below spec list is based on the latest news and rumors, so take it with a grain of salt. In regards to the Galaxy S10 X, we're expecting a 6.7-inch Super AMOLED display, four rear cameras + two front cameras, a 5,000 mAh battery, over 10GB of RAM, and 1TB of internal storage. When will the phones be released? Perhaps the biggest question on your mind is "When will I be able to buy the Galaxy S10?". On January 10, Samsung officially confirmed that it'll hold an Unpacked event on February 20, 2019, in San Franciso to announce the S10 series. Earlier rumors suggested that Samsung would announce the phones at Mobile World Congress, but with the event being held just a week before the trade show begins, Samsung appears to be confident that its new batch of phones are worthy of their own, standalone event. Following the February 20 event, one report claims that the Galaxy S10 Lite, S10, and S10+ will be available for purchase starting March 8 with the 5G-capable Galaxy S10 X launching a bit later on March 29. That same Gizmodo report referenced above also shed some light on how much we can expect to pay for the various S10 handsets. The above prices are for the models with 128GB of storage. The S10 will also be available in a 512GB model that'll supposedly set you back £999/$1250. As for the S10+, it'll be offered in 512GB and 1TB models as well that'll sell for £1099/$1390 and £1399/$1760, respectively. Galaxy S9 and S9+: Everything you need to know! Galaxy S9 vs. Galaxy S8: Should you upgrade?